To hasten the Second Coming of our Lord Jesus Christ by making high quality Bible-based and Christ-centered media available to the whole world. To be a trustworthy global provider of Bible-based and Christ-centered media. The Gospel must be preached to the world before Christ can come (Matt. 24:14). The world cannot hear the Gospel without a preacher (Rom. 10:14). AudioVerse exists to deliver the preacher freely to the whole world so that Jesus can come. Faith comes by hearing, and hearing by the Word of God (Rom 10:17). Man shall not live by bread alone, but by every word that proceeds from the mouth of God (Matt. 4:4). 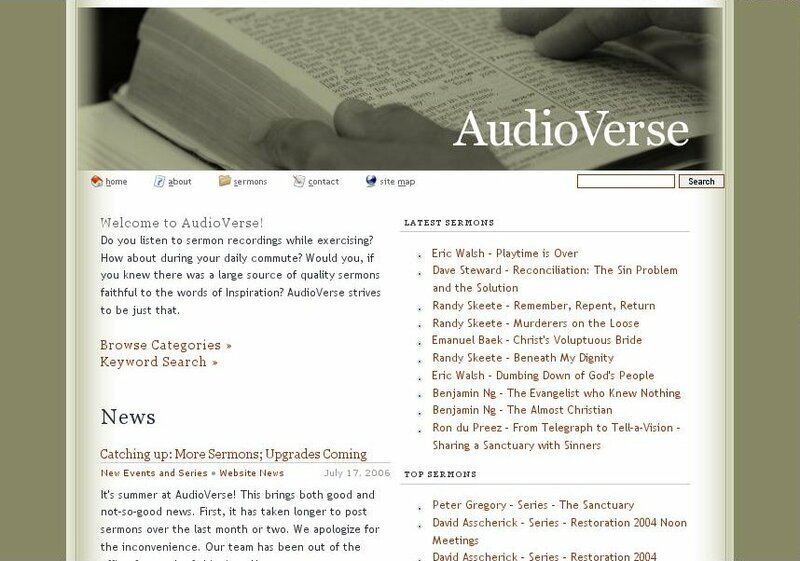 AudioVerse exists to nourish faith by giving easy access to the Word of God. Jesus is the Word (John 1:1). Jesus says that His Word is truth (John 17:17) and they are life (John 6:63). To know Jesus is to have eternal life (John 17:3). AudioVerse exists to help people know Jesus. AudioVerse is an online collection of thousands of Bible-based media content that is available for anyone in the world to stream and download for free. This ministry has a global reach that impacts thousands of individuals every single day. AudioVerse is a 501(c)(3) nonprofit organization in the United States of America. AudioVerse holds a high standard for the content that is presented on its website. The guidelines for these messages are called the Spirit of AudioVerse and you can read them here. This spirit of excellence extends also to the way the ministry operates and in all its dealings. Nearly 3 billion people have access to the Internet as of 2014, and that number is increasing every day. This number includes countless closed countries into which physical missionaries cannot easily go. Leveraging the ubiquity and cost-effective nature of the Internet, AudioVerse seeks to light up the world with access to Bible truth. All around the world there are people who yearn for the Gospel, but they cannot afford to pay for it. These may be individuals in developing countries or simply young people in school. If the Gospel is to go to them too, then as many barriers must be removed as possible, and cost is one of them. This is only possible through the generous financial support of donors who believe in this mission. AudioVerse is a supporting ministry of the Seventh-day Adventist Church, and seeks to be in full harmony with the church’s purpose and mission. AudioVerse is also a member of ASI (Adventist-laymen’s Services and Industries). A small team operate AudioVerse out of the ministry’s office, but many volunteers contribute their time and energy throughout the year as needs arise. You can learn more about the team behind AudioVerse, as well as the Board of Directors, at the Meet the Team page. How did AudioVerse get started? AudioVerse began in 2005 as an idea by Tim Arakawa and Curtis Farnham, both poor graduate students at the time. It was spurred by increasing requests for sermon recordings from various ministries with which Tim and Curtis had been involved, including Advent HOPE Sabbath School, Restoration Ministry, and GYC Southwest (formerly Southwest Youth Conference). They were excited about this idea not only because it would fulfill the immediate need (and make less work producing CDs! ), but because they saw that these messages of hope, love, and the soon return of our Savior Jesus Christ, could be a blessing to people worldwide who were seeking knowledge and wisdom about God. Curtis put the idea into action and quickly began developing a sermon website. A contest was held at Advent HOPE Sabbath School to choose the name, during which over 100 names were submitted. "AudioVerse" was the winner, and the AudioVerse.org website was launched on October 22, 2005. Since that humble beginning, God demonstrated His providential leading of this ministry many times. The initial bandwidth for the website was donated by a friend of the ministry who operated his own Internet service provider, which was crucial in meeting the traffic generated early on. Later, an unsolicited donation enabled us to upgrade and expand our entire server infrastructure to better serve the whole world. Not to mention, tremendous partnerships have been developed with various ministries like ASI, AMEN, and GYC (along with many smaller affiliate GYCs). Website traffic has also grown tremendously. Now millions of sermons are downloaded and listened to every year! The people accessing these messages come from over 200 countries from all corners of the world including many closed or developing countries in the 10/40 window such as countries in the Middle East and China. As this website has grown, we have had the opportunity to feature recordings in other languages than English. In an effort to reach as many people as possible, messages in Spanish, French, German, and Chinese are now available with more to come. Discover the beauty of Jesus and His Word by listening to these messages yourself. Tell your family and friends about this free resource. Read the incredible testimonies of people like you who have received a blessing. Share with us your stories of how these messages are making an impact in your life. Discover some of the needs the ministry and how you can help. Give your financial support to continue transforming even more lives with AudioVerse. Want to know more about AudioVerse? If you're interested to know more about this ministry and would like to hear some stories of lives that have been blessed by it, watch this television interview of Tim Arakawa, Co-Founder of AudioVerse and Alistair Huong, Executive Director of AudioVerse.